Our line of ice fishing tackle has been well received throughout the United States, Canada and the world. Our products have weathered the test of time and have proven to be very popular among ice fishing enthusiasts everywhere. HT Enterprises’ number one goal is to continue to offer the very best ice fishing tackle in the world, along with promotional support to help our dealers succeed. We will continue to do everything possible to keep the cost of manufacturing down, so that you will always remain competitive in the marketplace. Our wholesale-buying discount program has been designed to achieve maximum volume and high profits. In addition to pricing programs, we believe we offer our dealers a true advantage by partnering with fishing industry icons like Al, Ron and Jim Lindner, and Bob and Wayne Izumi. Our products are prominently featured on their television programs. And, in turn they are prominently featured in all our product promotional signage, literature and packaging. Our twenty-year association with high quality outdoor publications like The In-Fisherman, In-Fisherman Ice Guide and Walleye In-Sider Magazines and their editorial staff like Jeff Simpson, Matt Straw, Mark Strand and Bob Newman and others, means that fishing enthusiasts can barely turn a page during ice fishing season without seeing editorial or photo support of the HT product line. Our advertising program also includes Krause Publications’ widely praised Ice Guide along with countless regional fishing periodicals. This advertising and editorial support is invaluable to the HT brand and to dealers that proudly display the HT product and packaging. We’re grateful to our network of dealers and retailers and pledge to continually seek new ways to improve your businesses and users. Today’s most elite ice anglers such as Tom Gruenwald are uncompromising. They demand specialized gear that performs and meets their needs, regardless how challenging the conditions may be. If you’re like Tom, Polar Fire has what it takes to meet your expectations…and then some. Polar Fire. The industry’s best clothing, bar none, providing a complete heat and moisture management system that will not only keep you warm, but dry and comfortable, all day long, no matter how brutal it gets. Polar Fire. Powerful power augers providing the optimal combination of durability, power and torque to cut smoothly and efficiently, keeping you on top of your game. Polar Fire. Tip-ups with fully adjustable, multi-setting trip mechanisms that can be set from super-light to super heavy, while being guaranteed against freeze-up. Polar Fire. Premium ice rods designed in an ultimate array of designs and actions by today’s top pros to selectively match specific situations while providing unsurpassed presentation control and sensitivity. Polar Fire. 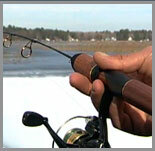 Ultra-smooth reels designed specifically to balance on these rods and operate flawlessly in frigid temperatures. Polar Fire. Gear designed by truly serious ice anglers, for truly serious ice anglers. And in today’s world, that’s truly something special. Polar Fire Gear. This is how it’s done.